Giveaway dose: #HarPalHappiness Offer by Asus. India is the land of festival and we celebrate a large number of festivals every year and each of the festivals are celebrated with great joy and happiness. Now that we are on the very edge of October and we have settled a bit after the ten days long excitement of Durga Puja now it is the time to prepare ourselves for yet another festival widely and commonly known as Diwali. Diwali is the festival of lights. It is the time of the year when we are almost on the verge of starting winter and we all have put our celebration mode on. Diwali is the witness of the win of good over evil and that the truth is pure and divine. It is also the time when we meet our loved once and share our love and joy by giving gifts to them. I still remember when I was a child I never liked to gift others and I was always upset with my mom and dad because they always used to gift stuffs to our loved once during the Diwali. It was few years later that I actually understood that it is the way of showing love and appreciation and today I too love gifting stuffs to my loved once and the expression on their faces while opening my gift is just priceless and it something I love the most. There are usually two reasons behind my gifting habit the first is what I mentioned above that I love to surprise people with my gifts and I love their expressions too and the other is that my gifts are usually something useful to the person I am gifting and thus this Diwali I am going to gift my Hubby a brand new Asus Zenfone. My hubby is a big gadget freak and almost half of the world knows it. His cell phones get old the very next day he buys one so there is nothing better than a phone as a gift for him. Asus Zenfone is among the best selling and leading Smartphone handset brand currently ruling the world. They have really understood the segment of the market and have understood it well that what the buyers want to buy and why. They have come up with a wide range of sets at wide range of prices yet affordable and believe me the handsets are just awesome and have very good specifications and functions. It is totally worth buying a Zenfone and thus I am going to gift him one this Diwali. But that is not it and let me be true to you guys. The Asus phones are really good no doubt and have very good configurations too but that is not only the reason of buying this phone. There is one more and bigger reason of buying a Zenfone for him and the reason is that Asus Zenfone has come up with a very exiting offer popularly known as “ #HarPalHappiness Offer” and according to this offer if you buy an Asus Zenfone you can win a Flipkart voucher worth Rs. 1000 every hour and one lucky customer can win a voucher of Rs. 25000 every day. Does not that sounds exiting? So the deal is that if you’re gifting an Asus Zenfone to someone , you too may be gifted a voucher of Rs.1000 and you too can shop something for yourself and not only that if you are extra lucky you can win the bonanza voucher worth Rs. 25000 too and that means you can buy yourselves a gift or too and if you have that 25000 worth voucher in your hand you can buy a diamond ring or a beautiful pearl pendant too. 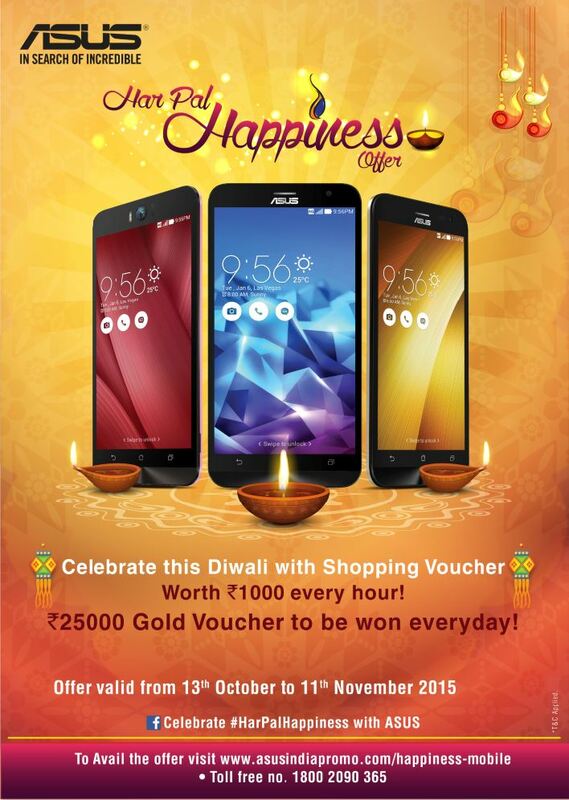 It all sound so exiting and it can be all true just if you buy an Asus Zenfone this Diwali. It is a great chance of more than 100% cash back by the Asus Zenfone and this “ #HarPalHappiness offer” is not to be missed at all. If you are not that lucky and you just get Rs. 1000 voucher it means that is also a bonus to you and you can shop and gift something to yourself too. I am really impressed by the “Har Pal Happiness offer” because gifting Asus Zenfone to your loved one means you too stand a chance to gift something to yourself and that is really extraordinary thinking by Asus and I really am counting on this deal because I am going to gift my hubby a Zenfone which basically means I am going to gift myself something too. Visit the offer here http://www.flipkart.com/asus?otracker=ts_asus_tabs_asusNewRange and gift your love to your loved once in for of an Asus Zenfone and stand a chance to win a gift for yourself too because it is “ #HarPalHappiness Offer” by Asus Zenfone.